Are you ready for half term? Here at Langstone Cliff we think there’s nothing better than spending family breaks in Devon! As one of the best places to stay in Dawlish, we’re happy to welcome families of all ages. That’s why we pride ourselves on offering plenty of family rooms where two children under 10 can stay absolutely free of charge – that’s right, accommodation and meals! We always make sure that we have something going on for our residents and non-residents here at Langstone Cliff and we’re happy Cosmo can join us for one the biggest children’s parties in Devon. Expect up close tricks and fun for children of all ages! Cosmo will be performing on Wednesday 24th October from 8pm! How many plates can you spin? Come and see the amazing Alan Austin and find out! The Bumbling Professor Returns to Langstone Cliff! 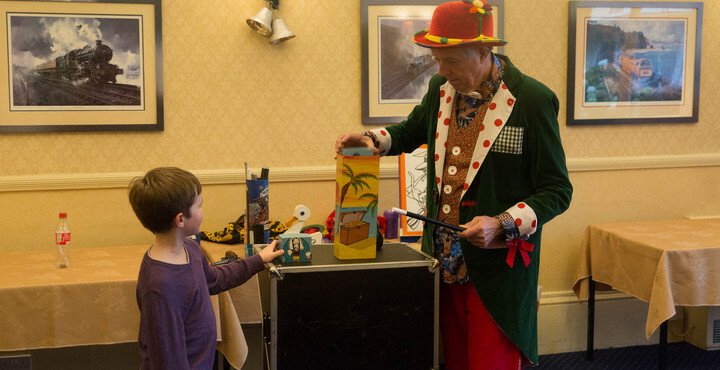 If you love balloons, magic and everything to do with the circus, then you won't want to miss Professor Bumble this Summer at Langstone Cliff.